One of the most enduring photographs in Jazz will forever be the sight of the great trombonist Melba Liston on stage, extending her arms at full stretch playing a brazenly low note on her instrument. It’s almost as some kind of cosmic force conspired to keep most women – except for vocalists, some pianists (Hazel Scott being one) and drummers (like Viola Smith) – out of the limelight. So even though the ladies of the Cuban band Anacaona showed the way, it wasn’t really news until Esperanza Spaulding broke through the glass ceiling and won her Grammy Award for Best New Artist that women bassist/singers felt empowered to come forward. The talented Nicole Saphos is quite apart, especially among the rest of the bassists who can sing.Tiptoe. Remarkably for someone so young, Saphos has chosen to launch herself in the trio format. It is arguably one of the most difficult formats to work in because the bassist is putting herself under immense pressure by putting a ceiling on melodic partnerships. Her choice to replace the customary (in a trio, at any rate) piano with the guitar is even more daring. However, John Lee is more than up to the task as he comes with a glorious ability to ‘hear’ Saphos with very large musical ears and respond with wonderful melodic lines that mimic her (human) voice. As a creative artist Nicole Saphos is irrepressible, yet she shapes each performance with galvanizing commitment. Her sound is always penetrating and focussed. “Just One Of Those Things” and a heartwarming version of Thelonious Monk’s “Ugly Beauty” open up a view of dynamics on the forceful side and her command of line stands firm, with just enough elasticity to give phrases the lift or space they need to take an organic place in the structural picture. For a clear example of the latter aspect of her playing take a careful listen to “Broken Ballerina”; this soars with impossible leaps and melodic pirouettes not unlike the character that she is playing. The song “Lady Hip’s Great Escape,” a great tongue-in-cheek title, by the way, brings Saphos’ ability to write idiomatically into sharp focus. And then there is Nicole Saphos’ singing, which is quite another kettle of fish. Ordinarily the listener would expect a pitch-perfect vocalisation of the melodic line from someone just starting to express themselves vocally. Clearly, however, Nicole Saphos has worked things out long before she put down her vocals in record for pitch doesn’t seem to matter for this young star. Nor should it. We are swept away throughout Tiptoe by her sense of breathless propulsion. Abandoning classical expressions of pitch Saphos allows her sense of gilded vocal glissandi to take music into unexpected places (Just One Of Those Things is a fine example of this) and her command of vocal color also tends to peek into hidden corners of songs where she always seems to turn something mundane into a vocal line that is truly extraordinary. Put the remarkable ability to sing and play bass into a tiny package and you have a stick of elegant musical dynamite in the form of Nicole Saphos. 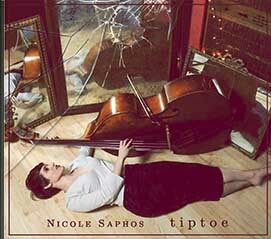 Be the first to comment on "Nicole Saphos | Tiptoe"